Isaacson Tax & Estate Advisors was created with two very distinct ideas in mind. Firstly, the vision was to create a "one stop" retirement center. This is for the client who needs the full scope retirement plan. We analyze investments and financial needs from an accountant's point of view, with the notion that "it's not how much you make, it's how much you keep". 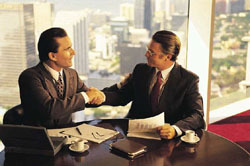 We also offer tax preparation services from our qualified tax preparers for a flat $99.00 fee regardless of complexity. We combine tax preparation with our comprehensive financial planning services, and complete the retirement package with a referral for a complimentary one-hour consultation with an Elder Law or Estate Planning Attorney for document review and or preparation. Secondly, we service hundreds of clients who already have their retirement plans in place but may need help with a specific need to make their plan complete. Unlike many financial firms, which may place unnecessary focus on placing their own company’s product, we are independent. Working with an independent company promotes the complimentary that you receive is unbiased and based solely on the merits of the best solution for any situation. Whether you need a complete retirement plan or you just have a single need, we seek to provide the most comprehensive and personal service available, which has earned us our reputation for excellence in our industry.